Paper as to Pickett's Men. The third day's battle of Gettysburg, more familiarly spoken of as 'Pickett's charge," has been so often treated in books and essays, that it would seem almost useless to write on the subject at this late day. In defense of the commanding general, whose conduct has been unwittingly impeached by superficial writers in search of a scapegoat for the untoward results of this fatal battle, and in justice to the troops engaged, it will hardly be regarded as out of place to cite some facts which have not ordinarily attracted attention. 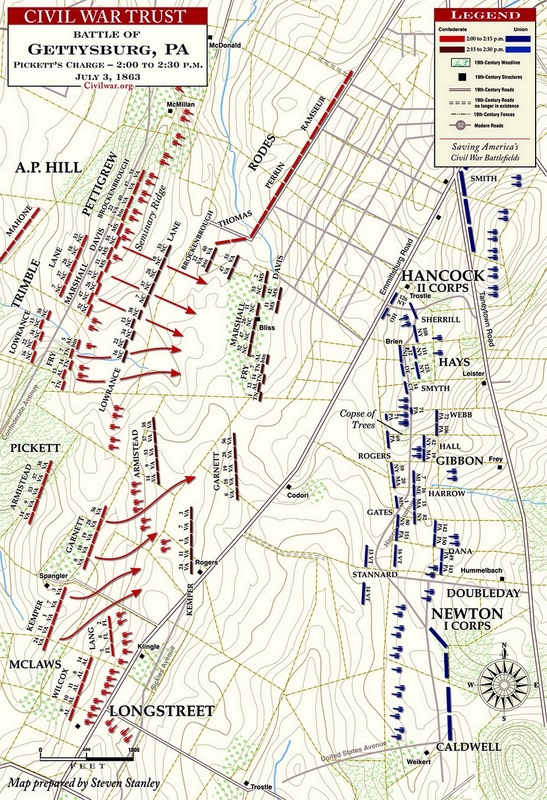 On the morning of the 3d of July the Federal line was complete, and occupied all the hills and ridges from Culp's Hill to Round Top mountain, without a break, while Kilpatrick's cavalry enveloped the Confederate right, where McLaws and Hood, with about eight thousand men, were confronted by the Fifth and Sixth army corps occupying an impregnable position. These facts, it would seem, decided General Lee to form a column of attack on the point where Wright's Brigade had penetrated the Federal line on the previous evening. "I never saw troops behave more magnificently than Pickett's Division of Virginians did to-day in that grand charge upon the enemy. And if they had been supported as they were to have been--but, for some reason not yet fully explained to me, were not--we would have held the position and the day would have been ours." This remark of the commanding general has been almost universally construed as a censure of Heth's and Pender's troops; but this is as unjustifiable as it is untrue. General Lee's official report was forwarded to the War Department January 20, 1864, more than six months after the battle, and there is not a word in that report which reflects on these troops. 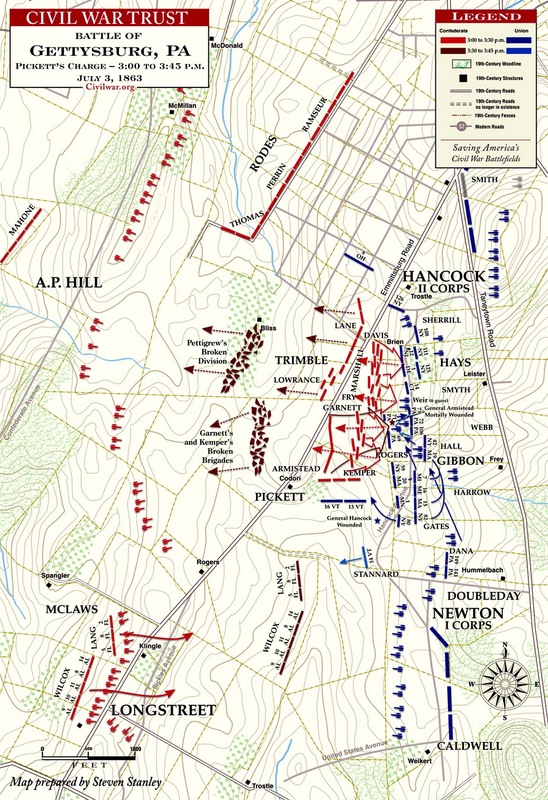 "General Longstreet ordered forward the column of attack, consisting of Pickett's and Heth's Divisions, in two lines, Pickett's on the right, Wilcox's Brigade marched in rear of Pickett's right, to guard that flank, and Heth's was supported by Lane's and Scales's Brigades, under General Trimble." General Longstreet in his report says: "Pickett's Division was arranged, two brigades in the front line, supported by his third brigade, and Wilcox's Brigade was ordered to move in rear of his right flank, to protect it from any force that the enemy might attempt to move against it. Heth's Division, under the command of Brigadier-General Pettigrew, was arranged in two lines, and these supported by part of Major-General Pender's Division, under Major-General Trimble. * * * *About 2 P. M. General Pickett, who had been charged with the duty of arranging the lines behind our batteries, reported that the troops were in order." It will thus be seen that Heth's Division was a part of the column of attack, and must not be regarded as a mere support to Pickett. General Lee further says: "The batteries were directed to be pushed forward as the infantry progressed, protect their flanks, and support their attacks closely." The strength of this formation can be readily apprehended. With a compact triple line of infantry, supported by some twenty or more batteries, commanded by Colonel E. P. Alexander, masked in what was virtually one battery, the shock must have been overwhelming. In addition, General Pendleton had placed at the disposal of Colonel Alexander nine howitzers, belonging to Hill's Corps, with which Alexander says he intended to precede the infantry, but when sent for they could not be found, some having been removed by order of General Pendleton, and others had changed their position to avoid the shelling. By comparing the following diagram, which represents the advance as it was made, with the preceding diagram, it will be realized at a glance that "Pickett's charge" was, indeed, a forlorn hope. Pickett's Division --Kemper's Brigade--First, Third, Seventh, Eleventh, and Twenty-fourth Virginia Regiments. Garnett's Brigade--Eighth, Eighteenth, Nineteenth, Twenty-eighth and Fifty-sixth Virginia Regiments. Armistead's Brigade--Ninth, Fourteenth, Thirty-eighth, and Fifty-seventh Virginia Regiments. Heth's Division --Archer's Brigade--Thirteenth Alabama Regiment and Fifth Alabama Battalion, and the First, Seventh, and Fourteenth Tennessee Regiments. Pettigrew's Brigade-- Eleventh, Twenty-sixth, Forty-seventh, and Fifty-second North Carolina Regiments. Davis' Brigade--Second, Eleventh, and Forty-second Mississippi, and Fifty-fifth North Carolina Regiments. Brockenbrough's Brigade--Fortieth, Forty-seventh, and Fifty-fifth Regiments, and the Twenty-second Virginia Battalion. Pender's Division --Scales' Brigade--Thirteenth, Sixteenth, Twenty-second, Thirty-fourth, and Thirty-ninth North Carolina Regiments. Lane's Brigade--Seventh, Eighteenth, Twenty-eighth, Thirty-third and Thirty-seventh North Carolina Regiments. Archer's was made the directing brigade of the line of battle. Charge and repulse of Pickett's Division. 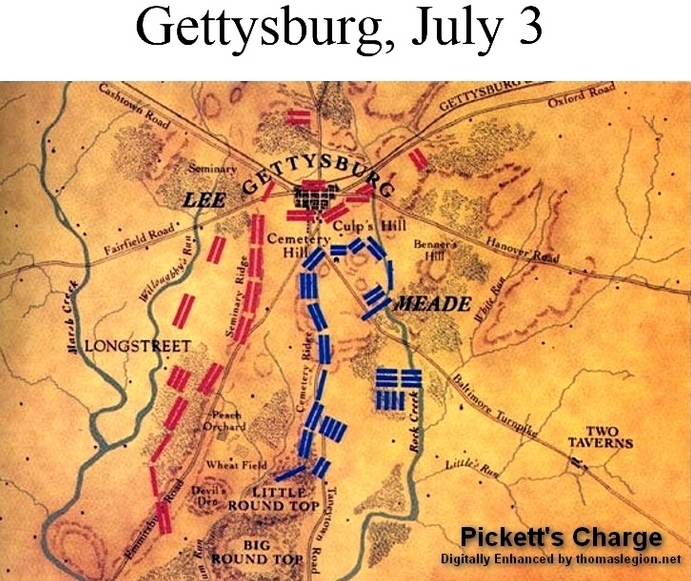 All these troops, numbering not more than 14,000, had, with the exception of Pickett's Division, been heavily engaged in the battle of the first of July. Brockenbrough's and Davis's Brigades, with absolutely no supports on the left or rear, unable to stand the tempest of shot and shell, gave way first. Pettigrew's Brigade dashed on, and, when within a short distance of the stone wall, a flanking column on the left poured in a destructive fire of musketry, causing what was left of the brigade to fall back. Archer's Brigade reached nearly, if not quite, the stone wall. From this point they retired to their former position on Seminary Ridge, passing through in a disorderly mass, and necessarily demoralizing to some extent the brigades of Lane and Scales, which continued to advance, however, some of the men reaching within a few yards of the stone wall; but none of the troops, except Pickett's, passed beyond the wall. A Federal authority says: "Alexander Hays had several regiments well to the front behind stone walls, and on his extreme right was Woodruff's Battery of light twelves. Whether the fire was closer here, or whether, as some claim, the troops in Pettigrew's command were not as well seasoned to war as Pickett's men, it is certain that the attack on Hays was speedily repulsed. That it was pressed with resolution was attested by the dead and wounded on the field, which were as numerous in Hays's front as on any other part of it." In the published records it is shown that medals were voted by Congress to Federal soldiers for flags captured from Pettigrew's, Archer's, and Scales's Brigades, every regiment in Archer's having lost their colors. The devotion and gallantry of the troops forming the left wing of Pickett's charge cannot justly be questioned. The rear and flank of Pickett's Division was to have been supported by Wilcox and Perry, but there is good reason for supposing that they did not advance until after the attack had been repulsed. From General Wilcox's report we learn that about twenty or thirty minutes after Pickett's advance three different couriers came with orders to advance--one of them from Major-General Anderson, probably a mile distant, to the left. General Wilcox adds: "Not a man of the division that I was ordered to support could I see." Colonel Lang, commanding Perry's Brigade, says: "Soon after General Pickett's troops retired behind our position General Wilcox began to advance, and, in accordance with previous orders to conform to his movements, I moved forward also." Colonel Alexander, in an article published since the war, says: "Wilcox's Brigade passed by us, moving to Pickett's support. There was no longer anything to support, and, with the keenest pity at the useless waste of life, I saw them advance. The men as they passed us looked bewildered, as if they wondered what they were expected to do, or why they were there. However, they were soon halted and moved back." General Anderson, with the remaining brigades of his division--Wright, Posey, and Mahone--was expected to support the left wing of the column of attack. General A. P. Hill, his corps commander, says: "Anderson had been directed to hold his division ready to take advantage of any success which might be gained by the assaulting column, or to support it, if necessary." General Anderson says: "I received orders to hold my division in readiness to move up in support, if it should become necessary." General Longstreet says: "Major-General Anderson's Division was ordered forward to support and assist the wavering columns of Pettigrew and Trimble." Anderson did not advance for the reason assigned by himself: "At what I supposed to be the proper time I was about to move forward Wright's and Posey's brigades, when Lieutenant-General Longstreet directed me to stop the movement, adding that it was useless, and would only involve unnecessary loss, the assault having failed." Colonel Walter Harrison, assistant adjutant and inspector-general of Pickett's Division, in "Pickett's Men," published in 1870, says that "the two other divisions (Heth and Pender) were to move simultaneously in support, charging in second and third lines." This indicates that there was some idea of a triple line at Pickett's headquarters, though Colonel Harrison's narrative of the battle in this and other respects is somewhat faulty. General Pettigrew was killed a few days after the battle, and made no report of his division. The reasonable inference is that the orders were misunderstood. The fact still remains, however, that five brigades did not advance to the support of the attacking column, and the left of Pettigrew's line was wholly unsupported. But there were other and most essential supports ordered to accompany Pickett's advance. General Lee's report, as before quoted, says: "The batteries were directed to be pushed forward as the infantry progressed, protect their flanks, and support their attacks closely." General Longstreet says: "I gave orders for the batteries to refill their ammunition-chests, and to be prepared to follow up the advance of the infantry." Major Eshleman reports: "It having been understood by a previous arrangement that the artillery should advance with the infantry, I immediately directed Captain Miller to advance his and Lieutenant Battle's batteries. Captain Miller, having suffered severely from the loss of men and horses, could move forward only three pieces of his own battery and one of Lieutenant Battle's section. Then, with one piece of Major Henry's battalion, under the direction of Major Haskell, he took position 400 or 500 yards to the front, and opened with deadly effect upon the enemy. With the exception of these five guns no others advanced." "Proceeding again to the right, to see about the anticipated advance of the artillery, delayed beyond expectation, I found, among other difficulties, many batteries getting out or low in ammunition, and the all-important question of supply received my earnest attention. "Frequent shell endangering the first corps ordnance-train in the convenient locality I had assigned it, it had been removed farther back. This necessitated longer time for refilling caissons. What was worse, the train itself was very limited, so that its stock was soon exhausted, rendering requisite demands upon the reserve-train, farther off. The whole amount was thus being rapidly reduced. With our means to keep up supply at the rate required for such a conflict, proved practically impossible. There had to be, therefore, some relaxation of the protracted fire, and some lack of support for the deferred and attempted advance." "The troops moved steadily on, under a heavy fire of musketry and artillery, the main attack being directed against the enemy's left centre. His batteries reopened as soon as they appeared. Our own having nearly exhausted their ammunition in the protracted cannonade that preceded the infantry, were unable to reply, or render the necessary support to the attacking party. Owing to this fact, which was unknown to me when the assault took place, the enemy was enabled to throw a strong force of infantry against our left, already wavering under a concentrated fire of artillery from the ridge in front, and from Cemetery Hill on the left. It finally gave way, and the right, after penetrating the enemy's lines, entering his advance works, and capturing some of his artillery, was attacked simultaneously in front and on both flanks, and driven back with heavy loss." There is no obscurity in the language of General Lee. The artillery did not render the necessary support, and, in consequence of this fact, the assault was a disastrous failure. This must be regarded as a complete vindication of the infantry. No blame can be attached to the officers and men of the artillery service participating in this fearful battle. They did their work nobly. Taking into consideration the facts referred to in this paper, nearly all of which are from the official records, it will be seen that it was no vain boast of General Lee when he said of "Pickett's charge": "If they had been supported, as they were to have been, we would have held the position, and the day would have been ours." It is perfectly apparent that General Lee attributed the defeat of Pickett solely to the failure of the batteries to advance as ordered; and it is equally certain that had the General been informed of the fact that the supply of ammunition was exhausted, the advance would not have been made at all. Recommended Reading: Pickett's Charge, by George Stewart. Description: The author has written an eminently readable, thoroughly enjoyable, and well-researched book on the third day of the Gettysburg battle, July 3, 1863. An especially rewarding read if one has toured, or plans to visit, the battlefield site. The author's unpretentious, conversational style of writing succeeds in putting the reader on the ground occupied by both the Confederate and Union forces before, during and after Pickett's and Pettigrew's famous assault on Meade's Second Corps. Continued below. Interspersed with humor and down-to-earth observations concerning battlefield conditions, the author conscientiously describes all aspects of the battle, from massing of the assault columns and pre-assault artillery barrage to the last shots and the flight of the surviving rebels back to the safety of their lines… Having visited Gettysburg several years ago, this superb volume makes me want to go again. Organized by order of battle, each brigade is covered in complete and exhaustive detail: where it fought, who commanded, what constituted the unit, and how it performed in battle. 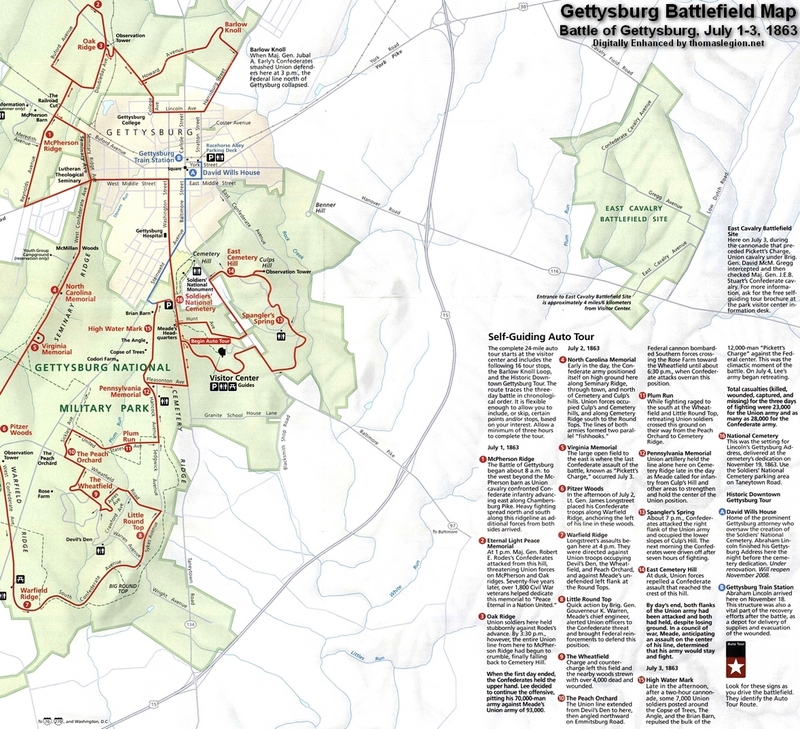 Innovative in its approach and comprehensive in its coverage, Brigades of Gettysburg is certain to be a classic and indispensable reference for the battle of Gettysburg for years to come. Drawing on exhaustive research, especially in unpublished personal accounts, he creates a moving narrative of the attack from both Union and Confederate perspectives, analyzing its planning, execution, aftermath, and legacy. He also examines the history of the units involved, their state of readiness, how they maneuvered under fire, and what the men who marched in the ranks thought about their participation in the assault. Ultimately, Hess explains, such an approach reveals Pickett's Charge both as a case study in how soldiers deal with combat and as a dramatic example of heroism, failure, and fate on the battlefield. With care and detail, Reardon's fascinating book teaches a lesson in the uses and misuses of history. Packed with new information and original research, Last Chance for Victory draws alarming conclusions to complex issues with precision and clarity. Readers will never look at Robert E. Lee and Gettysburg the same way again. Recommended Reading: Pickett's Charge: Eyewitness Accounts At The Battle Of Gettysburg (Stackpole Military History Series). Description: On the final day of the battle of Gettysburg, Robert E. Lee ordered one of the most famous infantry assaults of all time: Pickett's Charge. Following a thundering artillery barrage, thousands of Confederates launched a daring frontal attack on the Union line. From their entrenched positions, Federal soldiers decimated the charging Rebels, leaving the field littered with the fallen and several Southern divisions in tatters. Written by generals, officers, and enlisted men on both sides, these firsthand accounts offer an up-close look at Civil War combat and a panoramic view of the carnage of July 3, 1863.